The CK Bradley Warehouse is FULL of creative projects, new accessories and prints begging to be thought of, drawn up and created. This is our "Cutting Table" courtesy of WKP Construction. I know, it looks a lot like a Beirut Table. But during the daylight hours, before the CK Bradley Warehouse turns into the CK Bradley Nightclub, we call it a "Cutting Table". To Order or chat with us, call 401-847-977 or visit us at 28 Bellevue Ave in Newport, RI. Not available at ckbradley.com. 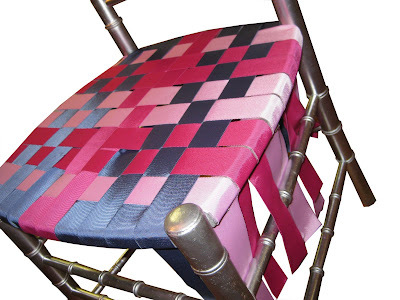 So back to the CK Bradley Warehouse and the project of the day: Weaving the seat of a ballroom chair with Grosgrain Ribbon. You might find a trip to the CK Bradley Warehouse more entertaining and inspiring than our boutique...that is if you can handle particle board floors and a bunch of cute sail makers upstairs. 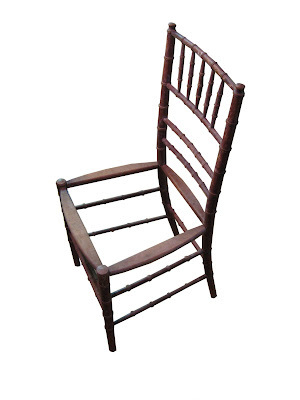 I started with an unpainted old Ballroom Chair we used to have at our Dining Room table. We happen to have a few dozen of these in barns and garages courtesy of a Dad who saves EVERYTHING. They can't be that hard to come by, although the ones that have caning/straw seats might be harder to find. Wood is nice, but better with more neutral ribbons. And if you know CK Bradley, 'neutral' is not in the vocabulary. So....I spray painted it silver to suit the ribbons better. 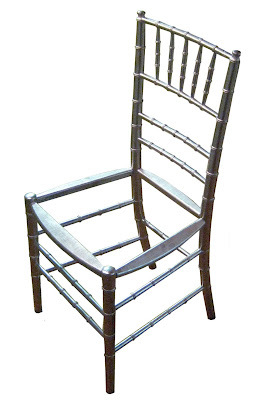 Any shiny lacquer paint would look great on one of these classic chairs. 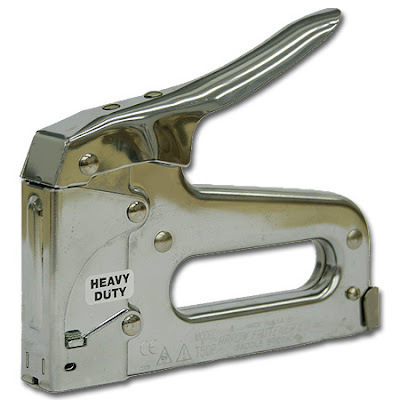 Then used a T-50 Staple gun, (which EVERY home should have) and wove my heart away listening to Brett Dennen playing Blessed. All in an afternoon's work. Now to weave the rest and design a room around a CHAIR. Omg, I ♥ it...idea in back pocket, check! Love it! 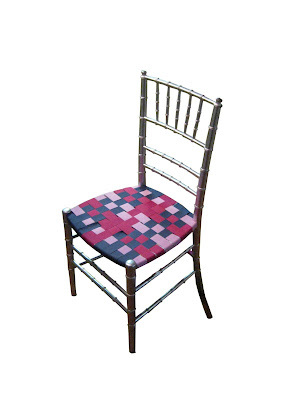 These would be so fun as Bride and Groom seats at a wedding!